Teaching it might take somewhat more! That’s why it’s so important to be able to tap into the experience and studies of other teachers and practitioners. With this in mind, we developed a mentoring program designed to give you the resources to improve your personal style of teaching, providing easily available support and guidance. The program is directed to all yoga teachers, from those with many years of experience that seek to keep growing and expanding their knowledge, to the beginners who wish to strengthen the foundation of their understanding. It’s designed to help you face the challenges as they arise, be they helping a student with particular needs to practice safely and effectively, creating a lesson focused on a particular topic or principle, or getting more deeply inside a pose. The fundamental principles of teaching that will be covered were extrapolated from many years of experience first as a practitioner, then as a teacher, and finally as a coach for teachers for many years. These principles will be the main focus of the program: the transmission of a knowledge that is spiritual before being physical or practical. 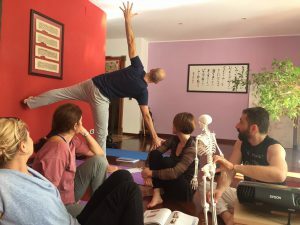 They will help you to conduct a class in your own style but always connecting to the deep source of Yoga. You and your students will feel the difference in the first classes already, in terms of a deeper connection between mind and body. The first skype call will give us the opportunity to talk about your experience, your expectations and how the program could help you meet them. Once you reach your decision, the real work begins. Mentoring doesn’t mean to spoon feed you ready-made answers, just provide an expert guide for your individual journey. With this in mind, the first step will be to work together to set your goals for the program. To help define the areas that need focusing on, you can record one of your lesson. We’ll review the recording together so the work can be tailored to what actually happens in the classroom. Reviewing lesson will be a regular feature of the weekly skype calls that are one of the staples of the program. The regular updates will help develop your understanding and tackle issues and doubts as they arise. In these, we will also discuss the basic principles of teaching, as they emerge from our discussion. You will also receive additional material for a more in depth study on a particular principle, in video or pdf format. The various tools we chose were selected to help you develop your personal way of teaching. That’s why we feel it’s important for you to have a direct line for feedback or any doubts that may arise in between calls, so our inbox is always open, or you can hit us up on Massimo personal number on whatsapp. The mentoring program has a standard duration of one year, however we offer a three months one for tackling specific issues. Write us and book a free skype call! “I transformed my practice and my teaching, and was transformed in turn. This was possible thanks to Massimo that shared with me his knowledge, his experience, his friendship and his understanding”. “I learnt the principles that stand at the root of teaching and now I can apply them comfortably. I feel more prepared, but also more challenged”.